Sanaa is a restaurant located in Kidani Village at Animal Kingdom Lodge. The food is influenced by African and Indian cuisine. Sanaa is a very popular restaurant with amazing atmosphere and wonderful service so we recommend booking this 180 days in advance. A huge bonus is that Sanaa overlooks the savanna and you might get to see some wildlife while enjoying your meal. Getting to Sanaa can be a bit of a trek. If you do not have your own transportation you will need to go to a Theme Park or Disney Springs first and then transfer buses to Animal Kingdom Lodge. Though Kidani Village is a part of Animal Kingdom Lodge it is fairly removed from the main building, the bus will first stop at Kidani Village and then go to Jambo House. Make sure to get off at the first stop. We drove and it was very easy for us to get to Sanaa. The only thing that wasn’t great is when we entered Kidani Village from the parking garage we were on a floor with hotel rooms and very far from their lobby. If this happens to you don’t worry, there are a lot of signs that will point you in the right direction. After checking in it took us about fifteen minutes to be seated. The restaurant was at capacity but even so we did not have a long wait until our server introduced herself and took drink orders. She had lots of information about the menu and even made some recommendations to us. This included the ever popular naan bread service with all the sauce options and the butter chicken. This was a very casual meal. The ambiance of Sanaa is very relaxed. The interior is rather dark and homey feeling with lots of African influences being brought in with heavy wood tables and wood polls blocking direct views all the way across the restaurant. It truly felt cozy and even though it was packed, lunch was a lesisurly experience and we never felt as though we were being rushed. We didn’t get seated by the windows so we didn’t get a chance to look out at the savanna but it didn’t take away from the experience at all. Though lunch was very relaxed service was still amazing. Plates were cleared promptly and glasses were always refilled quickly. The staff was truly excellent. All in all the meal took about two hours. What’s really amazing is that it didn’t feel like we had been there that long. I really still can’t believe that Kaitlyn made it through a meal that took that long. Our server was absolutely amazing and Kaitlyn got a light up cube and Tinker Bell to help keep her entertained. From what we experienced the food is very good but we have to say that it is a bit hyped up. 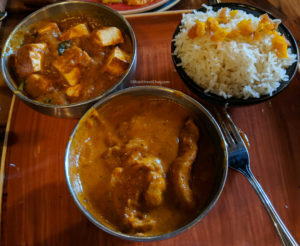 If you are someone who eats Indian food regularly (or grew up in an area with a large Indian population, like the SF bay area) and really enjoys it you might find the food here a little lacking if you are getting the Indian Food. 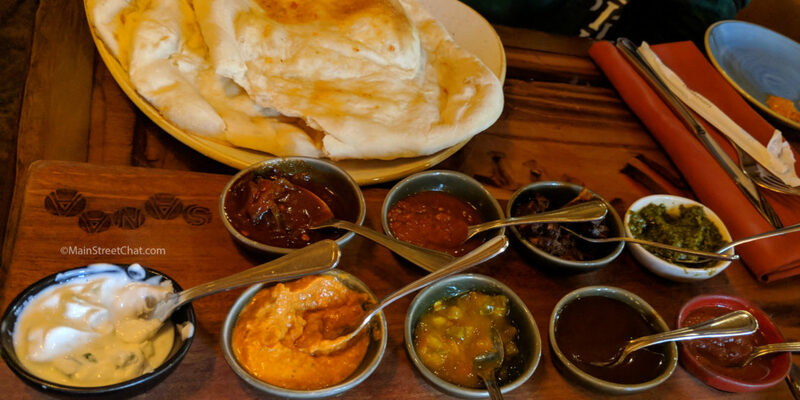 The Naan bread service is one of those things that we have to say is completely over hyped. 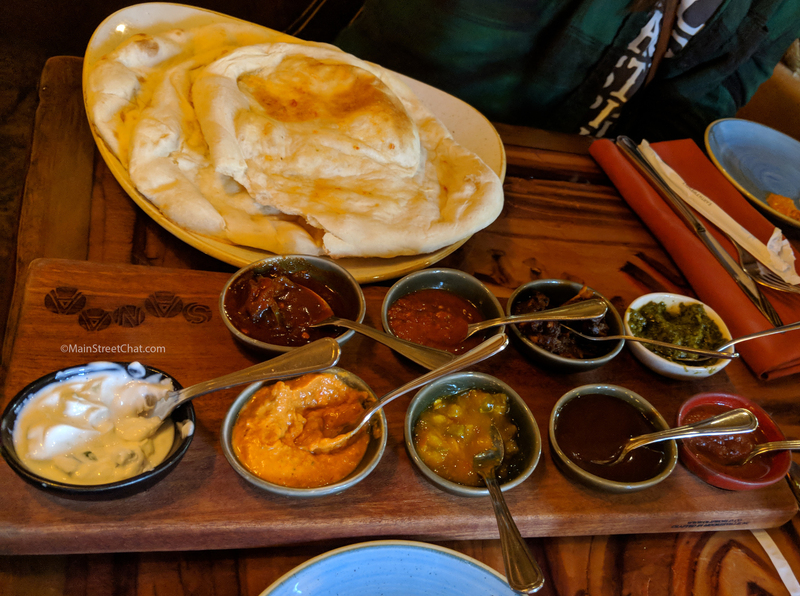 The naan is good and some of the sauces are great but we think it is really overpriced for what you get at $16. It’s also a lot of money to spend if you are not an adventurous eater. Many of the sauces are excellent. The red pepper humus, tzatziki, tamarind chutney, mango chutney and coriander chutney were all very good. The tomato date jam, garlic pickle, and chili sambal were not a hit with anyone in our group. We had a friend dining with us during this meal who has a pretty conservative palate. She only enjoyed the red pepper humus and the tzatziki. The coriander chutney also had a very strong flavor that only Elyse enjoyed. I’d like to clarify that we are not saying the bread service is bad we just feel that it is very expensive and may be a waste of money to someone who doesn’t enjoy being adventurous with their food. For main courses we tried the Kenya Coffee Barbeque Sandwich, Tandoori Chicken, and the Potjie Inspired which came with Butter Chicken, Paneer Tikka and Scented Basmati Rice. The Kenya Coffee Barbeque Sandwich was very good. It was a large portion of Naan bun filled with pulled pork. Served with warm root slaw and house potato chips. The pork was very flavorful, the only complaint being that there were some very large pieces of fat mixed in with the pulled pork. The coffee barbeque was very light helping to keep this dish from seeming overly heavy. The Sanaa potato chips were very good and the slaw was also passable. The star item was definitely the pulled pork and we would gladly get this again. 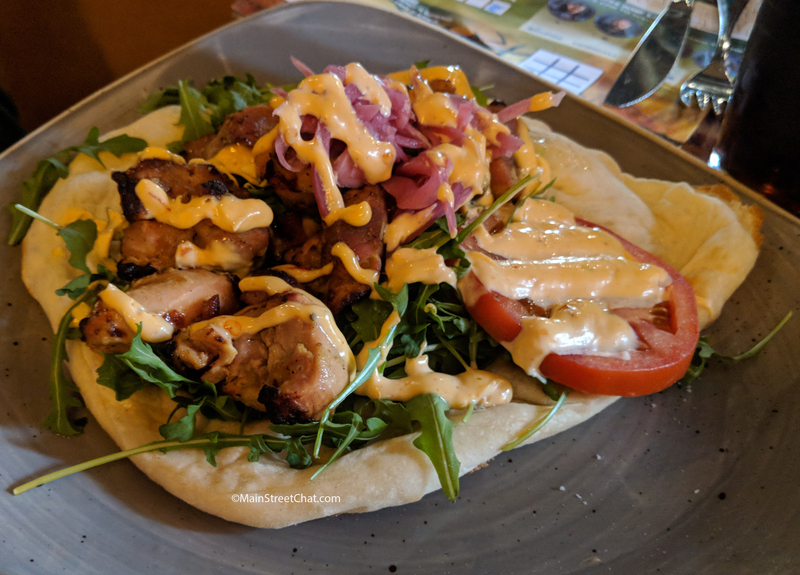 The Tandoori chicken is a large piece of Naan with Tandoori chicken, arugula, red onions, tomatoes and Sambal mayo. This is a great option for someone who is not an adventurous eater. It’s a simple but great and filling meal that won’t break the bank. Potjie Inspired is a meal option that allows you to pick a protein and a side served with basmati rice. We opted for Butter Chicken and the Paneer (Cheese) Tikka. The Butter Chicken was passable with a decent gravy but it honestly could have had a little more heat. Also some of the chicken pieces were fatty which really drew away from the dish. Because the dish does have a gravy you cannot see the fat beforehand and it was kind of a turn off on the dish. The Paneer Tikka we unfortunately have to say was downright awful. The paneer itself was of a high quality and very tasty but the masala was sour. And definitely not from the yogurt, something was off about it. The basmati spiced rice was perfection and we wish they gave you more of it so soak up the sauce of the butter chicken. Kaitlyn got the fish of the day, which happened to be Mahi Mahi. It came with edamame, corn, and pearl pasta. She loved the fish and actually finished it and ate all of her vegetables. The pearl pasta was a huge miss, she wouldn’t even try it. For desert we got the African Triple Chocolate Mousse and the Cold Brew XO to accompany it. The Mousse was very light and refreshing with three layers of chocolate. 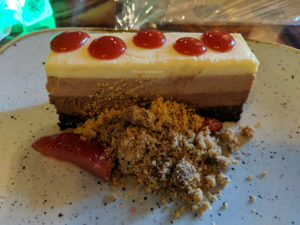 A white, milk and dark with a chocolate biscuit bottom and strawberries. We are fans of dark chocolate so this was a little bland to us but it is a very nice palate cleanser. The Cold Brew XO is a cold brew coffee with heavy cream, and Patron XO coffee liqueur. This was a perfect addition to our desert though in the future we will probably try something other than the African Triple Chocolate Mousse. 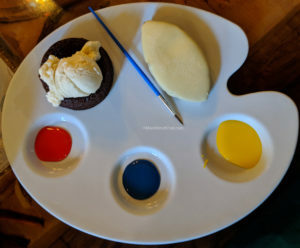 Kaitlyn got the African Shield Brownie for her desert and she had a great time playing with colored frostings. She also thought the brownie wasn’t too bad, or the ice cream. Would we eat at Sanaa again? Yes we would. Especially if we were staying at Animal Kingdom Lodge. We don’t see ourselves going out of way to dine here though. We do want to finish trying the other items on the Potjie Inspired menu. 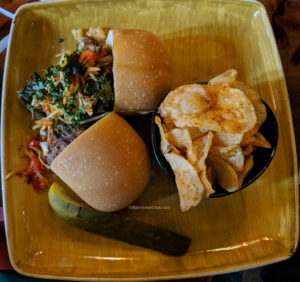 The Kenyan Coffee Barbeque Sandwich was very tasty and we would gladly go back for it. The meal was expensive but we could have easily cut back on the price a little bit by not getting the Naan Bread Board which is probably what we would do in the future. We would also like to try the dinner menu.